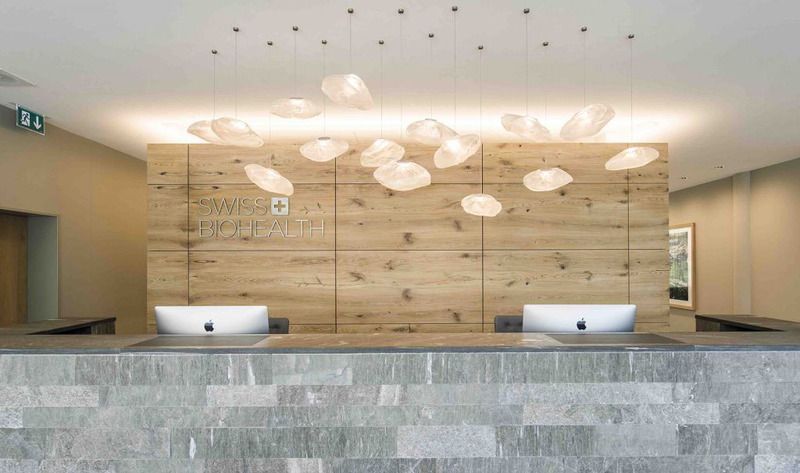 THE SWISS BIOHEALTH® Concept applies comprehensive, interactive treatment that considers all biological, medical and dental aspects as the only way to bring about profound healing. The concept mobilises and reactivates the natural immune system and bolsters the body’s self-healing abilities. This lays the foundation to cure even the most severe illnesses and provide a lasting improvement to quality of life. You most likely know already that dental health is closely related to many chronic diseases. The following provides you with information about our services and procedures. Your cooperation and understanding are essential elements of a successful treatment and therapy. > Download the medical history form as a PDF. There is a charge for this service. It comprises an initial examination (digital volume topography/DVT, meridian anamnesis, interference analysis and diagnosis) and discussion of the results. These results will be used to prepare a detailed diagnosis and treatment plan, including a schedule of costs. This is scheduled for the day before surgery. You should plan for at least 1.5 hours. Duration: 45 min.–1 hour per tooth. No pain or swelling anticipated. You will be able to work again as soon as the anaesthetic has worn off. Duration: 30–45 min. per tooth. No pain or swelling anticipated. You will be able to work again as soon as the anaesthetic has worn off. Preparation: none. Duration: 5–45 min. per tooth (in 1-3 appointments). No pain or swelling anticipated. You will be able to work again as soon as the anaesthetic has worn off. Duration: 1–4 hours on each of the three to four postoperative days. Duration: 30 min. to 1 hour. Please read this document carefully and only contact us if you do not find the answer you need in these FAQs, or if your question is not answered completely. 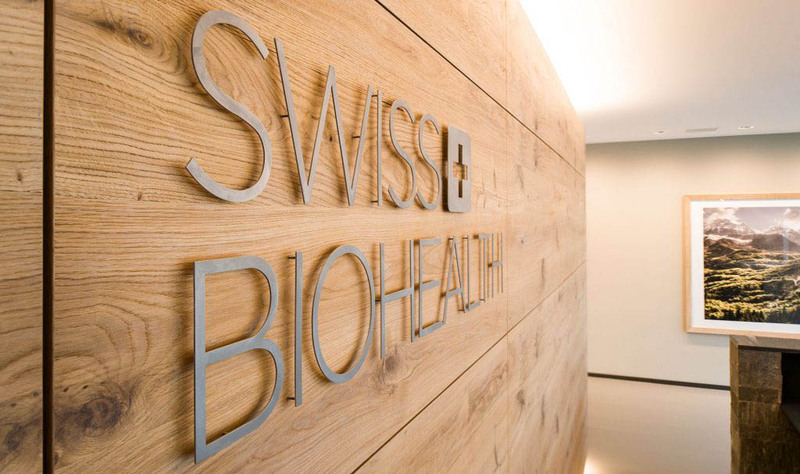 In these cases, please send your question by e-mail to reception@swiss-biohealth.com ; we will then be able to post the question and answer in this FAQ section. How do I get to the Swiss Biohealth Clinic? SWISS BIOHEALTH is based at Brückenstrasse 15 in 8280 Kreuzlingen/Switzerland on the banks of Lake Constance. The clinic is easy to reach by any means of transport. The closest airports are Friedrichshafen (FDH), Altenrhein (ACH) and Zurich (ZRH). You can catch a train directly from Zurich airport, which will take you straight to Kreuzlingen railway station just 200 m from our doorstep. If you are travelling by car, please take the A7 Swiss motorway, which ends at the Swiss-German border. From there it is just a few hundred metres to our clinic. If you are travelling from Germany, take the A81 or the B33 from Constance. Our clinic is situated just 150 m after the only inner-city border control point between Constance and Kreuzlingen. The entrance to the “Gardencity” underground car park is behind the clinic. It has reserved spaces for your convenience. From there you can proceed directly to the clinic entrance at Brückenstrasse 15. Please follow the signs. We wish you a pleasant journey. There are sufficient parking spaces available in the GARDEN CITY multi-storey car park. The car park is located in the same building as the clinic. Please ask reception for directions. Kreuzlingen railway station is just 100 metres away and can be reached in three minutes via an underpass. Kreuzlingen railway station has direct links to Zurich airport, so you can catch the train to Kreuzlingen directly from the airport if you are arriving by plane. The train journey from the airport takes around one to one-and-a-half hours. What hotels would you recommend? HOTEL SIX is a good, affordable option. It’s on the same street as our clinic, just three minutes away on foot. Please note! The hotel does not have bathtubs and there is no restaurant, only breakfast. Price per night: Standard double: CHF108. HOTEL 47 GRAD belongs to the superior mid-class category. It is a new and modern hotel with a well-equipped wellness area on the sixth floor that has a view of Lake Constance. The clinic is located around 30 minutes from the hotel on foot and approximately 15 minutes by taxi. Price per night: Select double: €130. HOTEL RIVA is a premium class, luxury hotel. It is situated directly overlooking Lake Constance. There is an exclusive spa and wellness area with a swimming pool on the roof of the hotel. The clinic is 10 minutes away by taxi. Price per night: Standard double: around €233. Wellnesshotel GOLFPANORAMA LIPPERSWIL also belongs to the luxury 5-star category. It is situated in a quieter area of the countryside, around 15 minutes from the SWISS BIOHEALCH CLINIC by taxi. Can I come alone or should I bring someone to accompany me? This is a personal decision, and depends on your specific condition and the scale of the operation. We would certainly recommend that you bring an accompanying person in the event that travelling on your own would be physically difficult and the operation takes a very long time. This person can then support and look after you. In most cases you will not feel unwell after the operation. In fact, our patients tend to have more energy after the operation and have to be ‘forced’ to take things easy. Our pre-treatment and follow-up treatment, as well as the surgical methods that we use, ensure that in most cases you will not have any visible external swelling and will not have any severe pain, even after very major operations. We will be happy to organise 24-hour care at a cost of CHF480/day in the event that you need assistance, but do not have anyone available (“INSTEAD HOME”). Please speak to reception about your requirements. Am I allowed to operate a motor vehicle immediately after the procedure? In this case you should always bring a companion. The anaesthetic can impair your ability to operate a motor vehicle in the hours following the operation. This is why we always recommend that your spend a few nights in a hotel. You should rest completely, avoiding all stress and physical activity, one day before the operation and at least four days afterwards. Will my insurance cover part of the treatment in the Swiss Biohealth Clinic? We are a private clinic in Switzerland. We will gladly send you a personal cost estimate that you may submit to your insurance provider to find out which part they are willing to cover. Please understand that, apart from the x-ray images and our brief operation report, we are otherwise unable to correspond with your insurance provider and that we instead invest our entire time, strength and attentiveness in the treatment of our patients. On no account will we be able to respond to a lengthy questionnaire submitted by your insurance provider. How should I prepare prior to the operation? The patient information booklet contains information on the BASIC IMMUNE PROTOCOL which you can obtain as a prepared mixture from the SWISS BIOHEALTH CLINIC. Alternatively, any doctor can prescribe each of the individual medications. You must start taking these supplements four weeks prior to your operation to ensure that your immune system receives the ideal blend of nutrients and is prepared for the operation. The booklet also explains how to prepare during the two weeks before the operation in terms of nutrition and lifestyle. We strongly recommend that you travel to Kreuzlingen the day before the operation and that you attend an infusion appointment to ensure ideal vitamin supply. You should not work on the day before the operation in order to break your usual work/stress rhythm. The final pages of the booklet contain information on the steps to take after the operation and what to do in the event of complications or if further treatment is required. How long will I be required to stay at the Swiss Biohealth Clinic? Your stay at the SWISS BIPOHEALTH CLINIC will be five to seven days if you require surgery, and up to 14 days if you require prosthetic follow-up treatment (tooth replacement with crowns or bridges), depending on the amount of work that needs to be done. You will receive a local infiltration anaesthesia with the anaesthetic Ultracain Forte (active ingredient: articaine). Dr Volz has used this anaesthetic for 26 years and has always achieved an adequate depth of anaesthesia without a single instance of adverse side effects. We do not use block anaesthesia as this can lead to an insufficient blood supply to the jaw bone and can stimulate the emergence of ischaemic osteonecrosis (NICO). Is it possible to receive a general anesthetics / sedation? half a tablet of the sedative Valium (diazepam) on the evening before , and half a tablet immediately before the operation. Simple systemic sedation with Dormicum (active ingredient: midazolam), which is administered intravenously at 1 ml (=5 mg) per hour. This is a simple sleep aid or sedative which is comparable with Valium. You will be able to breathe completely normally by yourself, but will experience deep relaxation. Once the procedure is over you will not be able to remember whether it lasted five minutes or ten hours. A minimal level of monitoring using a pulse oximeter (blood pressure monitor) is sufficient. You will be fitted with a nasal tube to administer oxygen during longer surgical procedures. Deep sedation: The anaesthetic propofol will be administered intravenously together with Dormicum at a dosage that means that you will still be able to breathe by yourself but will no longer be conscious. No tubes will have to be inserted, but you will need to be monitored in the same way as with a general anaesthetic. General anaesthetic including preparation and follow-up. In this option, you will be looked after by an anaesthesia team, including a specialist nurse. Propofol is a very well-tolerated anaesthetic administered on an individual basis in accordance with the latest medical findings. This means that you will be able to get up immediately afterwards and will recover from the anaesthetic very quickly. Will I need to obtain medication or liquid food in advance, specifically for the period after the operation? No. You will receive all medication from us here at the clinic. If you do require medication at a later date, we will provide a signed prescription for after-care medication in the booklet, so that you can obtain the medication anywhere and at any time. We will give you a package with the following content directly after the procedure: purified and oxygen-enriched SWISS BIOHEALTH WATER, one glass of stock, vegetable soup and a smoothie (all of them organic products), a SWISS BIOHEALTH toothbrush and toothpaste, Traumeel ointment, an arnica cloth, Ibuprofen pain medication and the Vivo Base system that you can use to shield yourself from the EMF radiation in your hotel. The package also contains instructions on ‘How to behave after the operation’. You will receive the SWISS BIOHEALTH ALKALI BATH the day before the operation. Vegetarians/vegans can of course exchange the stock for vegetable soup. Which infusions will I receive? Do I have the option of testing the materials in advance? This is possible, of course, and we will gladly send you samples of the materials that we use. Please be aware that none of the materials we use will present any difficulties for a healthy immune system (zirconium oxide ceramics, glass ionomer ceramics, Seramco polymers, etc.). Prior to restoration, the immune system is compromised and it is possible that these materials will provoke adverse reactions. But in 26 years of treatment, we have never experienced rejection of these materials AFTER restoration. Do I have to test the anesthetic I will receive in advance? Anaesthetics ALWAYS test negative, no matter which one is used. So there is no point whatsoever in conducting prior tests. Anaesthetics are a necessary evil to enable patient treatment. But the anaesthetics are metabolised or excreted very quickly. In 26 years of treatment, we have never experienced complications with the anaesthetic we use (Ultracain Forte = active ingredient: articaine). Can I combine cry-treatment by Sergej Dorochov with my stay at the Swiss Biohealth Clinic? Yes. It actually makes a lot of sense! Simply request that we send you the separate leaflet on REGENERATIVE CRYO-TREATMENT, which provides a detailed description of the procedure. Ideally, two sessions of cryo-treatment should be administered: the first one 2–3 days before our operation and the second one 14 days later, so around 7–10 days after our operation. If you prefer only one session of cryo-treatment, it can be administered either 2–3 days before our operation, or no earlier than one week afterwards. What can I expect in terms of follow-up treatment and the first few days after the operation? You will need to use the Hilotherm cooling mask directly after the operation, which we will also give you to take back to the hotel. When used consistently, this will prevent any swelling. On the day of the operation you will also be treated with various ointments designed to aid lymphatic drainage, and you will also undergo some magnetic field therapy. In addition, we will give you a package containing your choice of organic stock and/or puréed vegetables and/or smoothies for the first day after the operation, as well as purified oxygenated Swiss water. We will lend you the Vivo Base Home device for your time in the hotel, which completely and noticeably eliminates exposure to EMF (electromagnetic fields). If you wish to continue taking organic stock, puréed vegetables or smoothies after the first 24 hours following the operation, you can buy additional portions from us at any time. The day after your operation, you will receive a post-operative osteopathic manual-therapeutic treatment designed to eliminate any possible tension in your spine and jaw joint. You will also receive a post-operative vitamin infusion. Additional medication may be provided where necessary, including pain-relief infusions or additional IV antibiotics to protect against infection, depending on your specific case. On the second day after the operation you will receive treatment at our medical department in addition to the post-operative infusion. This treatment may include lymphatic drainage and detoxification methods such as cupping, acupuncture or neural therapy. You will of course have the support of our entire team during your further medical treatment by our biological practitioner, along with osteopathic treatment in our osteopathy department and additional infusions. Why do I feel so good on the first day after the operation, but slightly worse on the subsequent two days? The operation relieves the body of stress, which results in you feeling better on the first day afterwards. The healing process then uses up a lot of energy, so in many cases our patients say they feel slightly worse for wear on the following days. The body also starts to detoxify. You will feel much better, the more strictly you adhere to our protocol. Do I have to remain in the hotel after the operation or can I go for walks? What will my recovery phase be like? You must not go for walks or exert yourself physically in the first three days. You should relax. You may listen to music, read books or meditate. You should not read or watch any news or practice yoga. We also advise you to speak as little as possible to avoid irritating the wound. The sutures may also burst, or the wound area may experience more pronounced swelling. Are there any special considerations for sleeping in the first days after the procedure? It will certainly be the most comfortable to sleep on your back. This means that there will be no pressure on the side of your face. Please also use a second pillow so that your head is located at a higher position than your heart, which permits optimal lymph drainage. Can I use a mouthwash after the operation? We recommend that you do not rinse your mouth for five days after your operation, and after that only with water. Please refrain from using mouthwash solutions or other chemical preparations. How long should I cool with the Hilotherm cooling mask? It is most effective if you apply cooling for the first three to four hours directly after the operation. You can continue to cool during your infusion on the next day. It is also possible to use the Hilotherm cooling mask for a longer period if necessary. I have been fitted with a long-term temporary prosthetic / crown. When can I start eating again? You can start eating again as soon as the anaesthetic has worn off. But do not eat any hard foods, as the cement requires 24 hours to harden completely. Long-term temporary prosthetics fitted to an immediate implant must not be exposed to any strain for six weeks, so you should only eat soft food during this period. What are long-term temporary prosthetics, and when can they be replaced? Long-term temporary prosthetics are polymer crowns that are manufactured in the clinic on the same day, firmly cemented into place, are stable and look almost entirely genuine. They remain in the mouth for the period it takes the implant wounds to heal; they can be replaced with the permanent, fully ceramic crowns after 3 to 24 months. When will the implant wounds have healed completely? Implants wounds have a healing process that takes at least three to six months. You will receive individual information after your operation. When can I exercise, play sports ore use a sauna again? You can start playing sports again 10 days after the surgical procedure, provided you do not experience any complaints. After a sinus lift, you will need to wait 14 days before you can play sports of any kind. You must not visit a sauna in the first 14 days after the operation. What must I do if there are complications? Complications are practically unheard of due to the special treatment concept and the comprehensive pre-operative and post-operative care at the SWISS BIOHEALTH CLINIC. However, if complications do occur, you will find a list of complications on the second to last page of the booklet, which will inform your dentist of which solution to apply in any particular situation. On request, we can also provide the details of biological dental practitioners almost anywhere in the world who have attended training sessions at the SWISS BIOHEALTH CLINIC. Any complications that do occur usually manifest on the second or third day after the operation, which means that we can treat them at our clinic. What must I do if I experience sudden pain? Take painkillers (Ibuprofen 400 mg, 1–2 tablets every six to eight hours, up to a maximum of 6 tablets in 24 hours). If the pain does not subside, please contact us or an emergency dentist if you are unable to reach us. What should I do if there is sudden profuse bleeding? Take a freshly washed cotton cloth (do not use paper tissues! ), tie a knot in it, and press it onto your wound for 20 minutes (compression bandage). If the bleeding does not subside, please contact us or an emergency dentist if you are unable to reach us. Traces of blood in your saliva are not a sign of profuse bleeding, but can be treated in the same way. Please do not rinse your mouth in any way, as this will merely provoke more bleeding. Is a follow-up examination necessary? A follow-up examination will not be necessary in most cases. This does not apply if there is a re-occurrence of swelling or profuse bleeding. As a rule of thumb, you should not return home until the fifth day after any surgical procedure. You must not fly for around two weeks after procedures involving the construction of bone in the maxillary sinus. In general, you should also avoid strenuous sporting activities, intense sunlight and saunas for two weeks after the procedure. When will my symptoms start to improve? You will experience an improvement in your symptoms after roughly one to two weeks. However, each person reacts differently to an operation. You may still notice a slight cramp or tightness in the operation region after around six weeks; this will subside and is a result of the soft tissue healing. Gently massaging the outside of your jaw will alleviate these symptoms. What must I submit to receive a treatment plan and a cost estimate? We need you to send us a 2-D panorama x-ray image. You must also complete the medical history form in full. This is available from reception or as a download from the website. We also require your 25-OH vitamin D3 and your LDL cholesterol levels. Your immune system is only strong enough and your body able to produce healthy bones if your levels are above 70 ng/ml D3. An LDL level above 1.4 g/l LDL indicates a higher susceptibility to inflammation; your LDL level must therefore be < 1.4 g/l (< 1.0 g/l is better) before the operation. CHOUKROUN, Joseph, et al. Two neglected biologic risk factors in bone grafting and implantology: high low-density lipoprotein cholesterol and low serum vitamin D. Journal of Oral Implantology, 2014, 40. Jg., No. 1, pp. 110-114. SCHULZE-SPÄTE, Ulrike, et al. Systemic vitamin D supplementation and local bone formation after maxillary sinus augmentation–a randomized, double- blind, placebo-controlled clinical investigation. Clinical Oral Implants Research, 2015. BRYCE, G.; MACBETH, N. Vitamin D deficiency as a suspected causative factor in the failure of an immediately placed dental implant: a case report. Journal of the Royal Naval Medical Service, 2013, 100. Jg., No. 3, pp. 328-332. COOPER, Lyndon F. Systemic effectors of alveolar bone mass and implications in dental therapy. Periodontology 2000, 2000, 23. Jg., No. 1, pp. 103-109. If I agree to be a patient in a live operation, can I receive a deduction? We always select patients for our monthly live operations – which we perform as training procedures for dentists – who are scheduled to undergo a procedure to replace a root canal-treated anterior tooth with an immediate implant and long-term transitional prosthesis. These patients are given a generous deduction on their invoice and may also receive an appointment sooner. Kindly contact us if you are scheduled to undergo this procedure. Why do I need to make a deposit of 50%? Your deposit confirms your reservation for an appointment. We work according to the ALL IN ONE concept. This means that you are given a longer appointment – up to a whole day – in which an entire team of specialists is booked to work on your procedures, including preparation and follow-up. Your deposit is also a guarantee for us. Naturally, the deposit will be deducted from the invoice for your treatment. Will the amount stated on the cost estimate also be the grand total on my invoice? No! The grand total may deviate from the cost estimate by up to 20% in the event of unforeseeable difficulties and situations. Any additional services you would like to book, but were not included in the cost estimate, may also increase the grand total. How do I make payments to the Swiss Biohealth Clinic? We kindly request that you transfer the amount of the deposit invoice to the specified bank account. You will be asked to settle the remaining balance by credit card immediately after your treatment in our clinic. Naturally, we also accept cash payment in Swiss francs. Until when can I cancel my appointment? Our patients come to us from all over the world , meaning that we have to do our planning on a long term basis. We therefore need to be informed at least four weeks in advance if you are unable to make the appointment. Our preparation with the BASIC IMMUNE PROTOCOL also lasts precisely four weeks. Why are the waiting times so long? 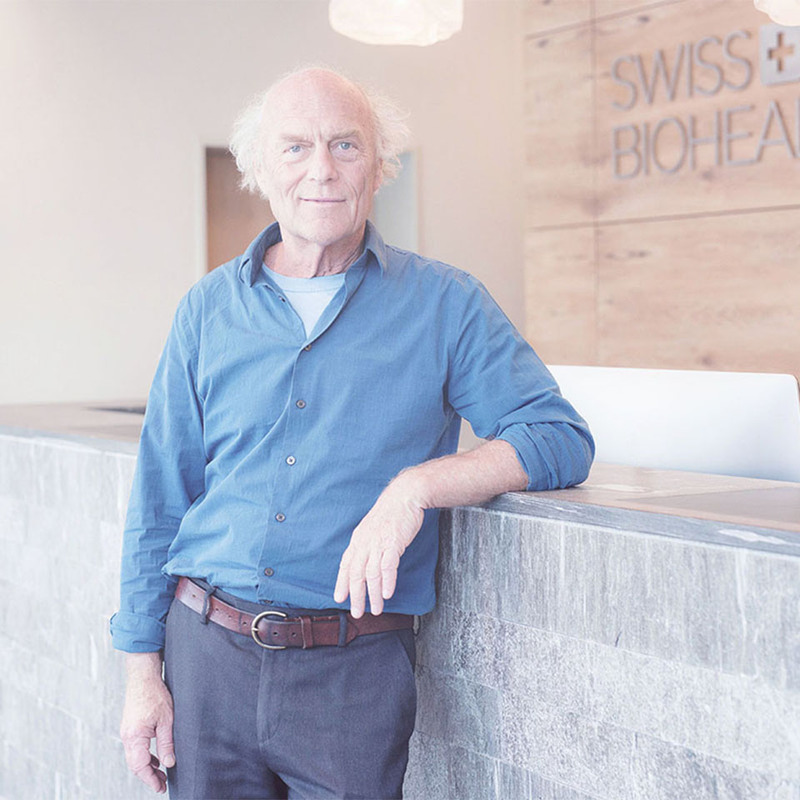 Patients are attracted to the SWISS BIOHEALTH CLINIC from all over the world due to the immense demand for biological dentistry, the option for immediate fitting of ceramic implants, and Dr Ulrich Volz’s work as a lecturer. Treatments following the ALL IN ONE concept take a lot of time and demand maximum concentration and attentiveness by the whole team; the current waiting periods are therefore between 4 and 6 months. But we do keep one or two appointments free each month to accommodate urgent cases. Kindly contact us if you feel that you qualify for one of these appointments. A 100 percent deposit must be settled before an urgent appointment can be confirmed. Is my follow-up treatment included in the price? The price includes standard follow-up treatment for the initial two to three days; it is stated in the cost estimate. We will discuss with you any additional medical therapies and follow-up treatments that you need or would like and will send you advance notice of the costs. Is it possible to remove several or even all amalgam fillings in one appointment? The answer to this question is a resounding YES for the amalgam removal protocol (AMX) used at the SWISS BIOHEALTH CLINIC. We use our proprietary sixfold special protection protocol to remove all amalgam fillings so that our patients experience no discomfort. It is therefore particularly beneficial if all fillings are extracted at the same time, as this procedure eases the burden on the immune system and helps to initiate the detoxification process. The tiresome discussions on how many fillings can be removed in one session is entirely misguided: either the protective system is perfect and all amalgam fillings can be removed at once, or the protective system is insufficient, in which case NOT A SINGLE amalgam filling should be removed. The protocol developed by Dr Volz has not led to a single deterioration in the patient’s condition since 1991, not even when treating patients with severe illnesses, e.g. those suffering from ALS. The AMX conforms to the specifications defined by Dr Dietrich Klinghardt, Dr Joachim Mutter and Dr Rainer Wander. Can I receive a sample of my cavitation, or can it be sent in? If you like, we can give you some material from your cavitation, conserved in a saline solution or in alcohol. However, we do not have any way here in Europe of testing samples from DNA CONNEXIONS for borrelia, babesia, bartonella and other pathogens, as the laboratory in the United States requires a deep frozen sample, which is not possible due to the distance. How is it possible that the analysis / diagnosis states I have a cavitation in my wisdom tooth region, even though I never had a wisdom tooth there? A tooth germ will certainly have existed, even if you never had a wisdom tooth in a certain region. A weakness on this meridian will have prevented the germ from developing into a mature wisdom tooth. This germ will have ‘wasted away’ over time, creating an ideal breeding ground for a cavitation. Patients with this history frequently have particularly large cavitations in these regions. Why was I advised to have my wisdom teeth extracted, although they are correctly positioned? The wisdom teeth will never be used, as the mastication centre is directly behind the canines. Frequently we will use the innermost section of a set of scissors to cut a particularly hard item. Similarly, the wisdom teeth tend to have especially pronounced interference contacts, as they are located close to the mandibular joint. These defects are rectified by extracting the wisdom teeth; a new and healthy bone structure forms behind the 7th roots (second molars), and a particularly strong gum (known as the ATTACHED GINGIVA) is produced around the 7th teeth (second molars). Moreover, it is only possible to remove a cavitation – which almost always extends into the 9th tooth region – once the wisdom teeth have been extracted. Which material is used in the ceramic implants? The implants are made of the high-performance ceramic zirconium oxide (ZrO2). They are 100 percent metal-free and biocompatible, do not contain any free electrons and therefore do not create a bonding point. The melting point is 2,400 °C, and the material is harder and stronger than steel. Which bone replacement material is used for the sinus lift procedure? We exclusively perform the sinus lift procedure (to build bone structure in the maxillary sinus) using autologous material from the patient. The patented SINUS IMPLANTS developed by Dr Volz allow the operator to obtain bone replacement material used in the lift procedure exclusively from the PRF membranes in the patient’s blood, as well as from bone splinters acquired with the SAFESCRAPER. The SWISS BIOHEALTH CLINIC never implants animal material or material from other human donors. We do use synthetic material (tricalcium phosphate) in very rare cases. An immediate implant is one that is fitted immediately in the same position after a diseased tooth has been extracted. Will I receive a crown in my implant right away? You will be fitted with a temporary, tooth-coloured crown to restore an attractive look, at least in the aesthetic (visible) regions. This may vary for each individual, depending on the implant position and the operation situation. Will I need to undergo further treatment in the weeks and months afterwards? Most of our patients are referred to us by biological therapists, who can then resume the subsequent treatment. Our treatment removes all metals, replacing them with neutral materials (ceramic implants, ceramic inlays, ceramic crowns); it also gently extracts all root canal-treated teeth, foreign bodies, remains of roots and degenerative inflammatory areas (ischaemic osteonecrosis, cavitation) and uses endogenous growth factors (PRF) to stimulate healing. It goes without saying that in the weeks and months following the operation the immune system should be strengthened, healing mechanisms stimulated, bone generation materials produced and poisons and toxins expelled. Your attending biological therapist will usually have protocols to help with this. The last page of the booklet contains a suitable proposal for this post-operative treatment and care. We always use absorbable sutures, which disintegrate by themselves after four to six weeks. Please do not have any sutures that bother you when eating or speaking removed until three weeks after the operation at the earliest. The dentist does NOT have to make every effort to remove the complete suture, as any residual pieces (e.g. below a temporary prosthetic or in the gums) will be absorbed (will disintegrate) by themselves in the following weeks. A Teflon membrane to cover the wound was implanted during the operation. When does it need to be removed? The membrane will not disintegrate by itself. Under ideal circumstances it should be left in place for six weeks to enable optimum wound healing. But it can be removed as early as after two weeks if you experience a reaction to the foreign body. When will the permanent crown be fitted? We remove the long-term temporary prosthetics after three to six months; then we prepare the teeth and implants once again – a kind of ‘fine tuning’ – which allows installation of the crown edges precisely on the level of the gums or very slightly below. A mould is then taken for the dental technician. A digital mould is produced for individual crowns on the side of the jaw; the crown is then produced immediately and fitted a few hours later on the very same day. A conventional mould is taken and produced as a plaster model for larger procedures or for crowns in the visible regions of the mouth. The master dental technician then uses these moulds to produce the crowns. We inspect these crowns together with you (fitting appointment) and alter them if necessary before they are cemented in place. There will be a period of between five to ten working days between the mould appointment and the cementing appointment, depending on the number of crowns. Can I return home or take a holiday between the moulding appointment and the cementing appointment? Of course! There are no restrictions on what you can do when you leave the SWISS BIOHEALTH CLINIC after the moulding appointment. The appointment does not involve any surgical intervention, so you are free to return to work or go on holiday. Can my usual dentist manufacture and fit the permanent crowns? Basically yes. But we would only recommend this procedure in certain individual cases. As soon as another dentist starts to produce the permanent crowns on fully healed implants, he or she must be certain that the implants are perfectly osseo-integrated. A production of crowns on these implants would otherwise be forbidden. This means that the dentist accepts full responsibility that the implant + crown unit will function perfectly. But crowns that produce tension or are fitted too high can destroy or loosen well-healed implants. This will always provoke discussions on who is responsible for the deficiencies, even if the matter is actually crystal clear (as described above). We therefore recommend that also you have the permanent crowns produced in the SWISS BIOHEALTH CLINIC, so as to ensure that responsibility stays in one place. If you do decide to have the permanent crowns produced by a different dentist, he or she should have at least completed a course in THE SWISS BIOHEALTH CONCEPT. What might be the reasons if my condition deteriorates again weeks or months later? Cavitations for many years or even decades can mean that your immune system has become sensitive to the sympathetic nervous system and has switched off due to this permanent stress. This has made you a perfect host for all kinds of micro-organisms like viruses, fungi, bacteria and suchlike. We restored your teeth and removed all oral stressors. Now that your immune system has started working again, it has become aware of all the micro-organisms that were able to remain and proliferate in your body undisturbed for years and decades. This is why you may initially feel a deterioration in your condition some time later. This can be avoided if your attending physician provides good care after our operation by examining and treating you for the presence of these micro-organisms. This is comparable with a student who never feels ill during exam times, as his immune system switches off. But he does become ill during the relaxation phase afterwards, when the parasympathetic nervous system and therefore the immune system switch back on and start dealing with the infections that accumulated during the examinations. What must I do to maintain my improved condition? Kindly adhere to the recommendations in the follow-up treatment protocol and check your 25-OH vitamin D3 and your LDL levels every two to three months. The vitamin D3 level must never fall below 70 ng/l, while the LDL level should not rise above 1.0 (max. 1.4) g/l. If this does happen, you must immediately increase your daily D3 intake and reduce the LDL level by observing the recommendations in the dietary protocol (SWISS BIOHEALTH FOOD DESIGN). Furthermore, it is possible to send us a current 3 D / ST scan ( at least six months past surgery). This way, we can analyse from our part, if everything has healed successfully.